I have four nest boxes in my yard and all have entry holes sized for native birds such as House Wrens, Chickadees and House Finches. These holes too small for a House Sparrow to enter. I also have a roost box to provide shelter during the winter. It is not suitable for nesting. To conserve heat it has an entry hole at the bottom and little ventilation. Inside are six perches that can house about 12 birds. The entry hole is large and, since it is at the bottom, the box is not secure for nestlings to be safe from predators. No birds have ever tried to nest there so I leave the box up year-round. Last week my observant husband informed me that sparrow were going in and out of my roost box and that the box was chirping. Really? Really! As a volunteer bird monitor, one would think I would be aware of what was nesting in my own backyard, and usually I am. But sparrows are sneaky and I completely missed a successful nesting attempt! How embarrassing. In my defense – sort of – the box is behind a huge Spirea Bush. If that looks like a fairly large baby bird exiting the box, it is. By the time they leave the nest they have grown almost as large as their parents. 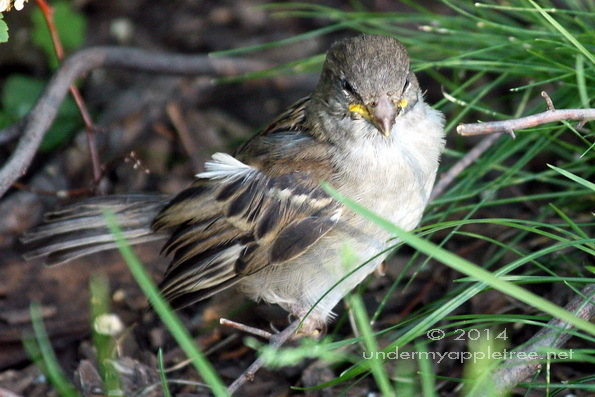 I don’t mind House Sparrows visiting my feeders and bird baths, but I try to discourage them from nesting in my yard. Why? Because they are very aggressive and will actively compete with native species for nesting sites. And they don’t need our help. They are a non-native species in North America and have been very successful in adapting. Successful to the point of disrupting native species. For the past two summers they have driven off the House Wrens that usually nest in my yard. Wrens are not shy and can be very territorial, but they had a difficult time with the sparrows constantly trying to enter their nest boxes. It is illegal to interfere with nesting native bird species. However, House Sparrows, along with Starlings, are not native and considered invasive and can be removed without a permit. Every year I catch the sparrows trying to build a nest in my awning or gutters, and when I see it I remove the nesting material. But once there are eggs in a nest, I leave them alone. Four or five little guys popped out of the roost box yesterday. It took most of the day for the parents to get all of them to come out. 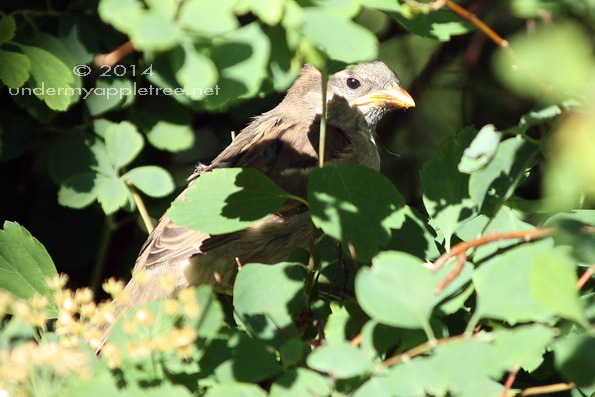 This morning the parents were feeding them as they chirped and begged from the shrub and the apple tree. Soon they will learn to find their own food and the parents will attempt a second brood. Though this time, not in my roost box. While the global population of the House Sparrow is in decline, they are still plentiful in the US and are not on the watch list. UPDATE: The final total was seven nestlings. They spent the next two days in my yard learning to fly and ate every last sunflower seed in both of my feeders. Then they began eating the peanuts I put out for the woodpeckers. I look forward to your bird photos and narrative every week. You’ve given me an appreciation for the birds in my own backyard and I’m now more aware of them. Thank you for that gift! You must have an amazing camera- your photos are always so clear and I love how close up! Thanks. The camera is an older Canon Rebel XSi. I was able to get pretty close to them, plus I use a fast shutter speed and set the focus to detect motion. It’s all in the settings. Lots of sparrows in my area too. Love the pics, Leslie. How did they manage to escape your notice? You are definitely a “watcher.” They must be sneaky…LOL. They are! The Spirea is about 5 ft x 5 ft and it obscures the box. They would go around the back of the shrub and enter the box. Since they are always hopping around in the bushes, I didn’t pay any attention to what they were doing. It could be a wren. They nest in odd places and I’ve heard of them going in feeders before. Or hanging baskets, old shoes, they can be creative. I have a robin that is building a nest in the Clematis on a fence along my driveway. She must be a first time mom because that is not a good spot. Interesting story! So the sparrows are a bit like grey squirrels in England: they’ve taken the place of the native brown squirrels almost all over the place. Such a pity, but I guess non-natives of any species can have the upper hand in a new environment. I didn’t know that grey squirrel was brought to England. They are all over the place here, plus we also have Fox Squirrels, which are the larger brown ones. And they love to eat bird seed! I remember my dad and brother trying to get purple martins to nest. Mostly, I remember it as being a constant process of clearing out the sparrow’s nests. That’s right, they cause problems for the martins too. We have a couple of active Purple Martin colonies in the area and they have a bird monitor who removes the sparrow nests. We had a bird nest on our front porch again this year but I’m not sure what kind of bird it was because the nest was rather odd. I love watching them. Next time the bird shows up take a photo. Maybe I can identify it. Now that all the babies are out of the box I’ll clean it out and cover the opening with something they can’t chew through – probably a piece of metal or wood. The roost box has an opening of 1-3/4 inches. 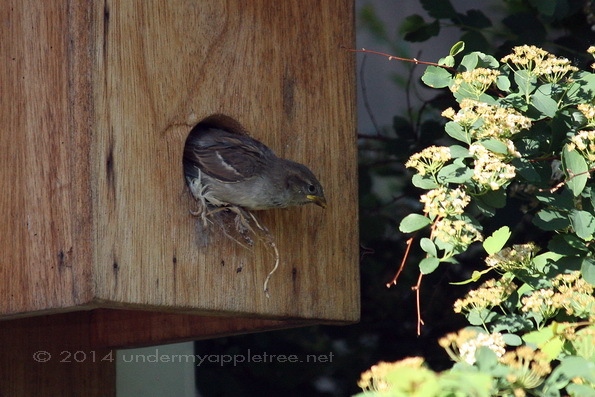 My nest boxes have a 1-1/4 inch opening, which is too small for sparrows but perfect for wrens. House sparrows haven’t found my backyard yet! thankfully. I don’t particularly like them, for the same reasons you mentioned. You have to admire their ability to coexist with us in urban areas though. They found me because my neighbor put up a big “bird house” with two large entry holes. It’s been there for many years now – stuffed with who knows what, they never clean it – and the sparrows love it. Brood after brood pop out of there. 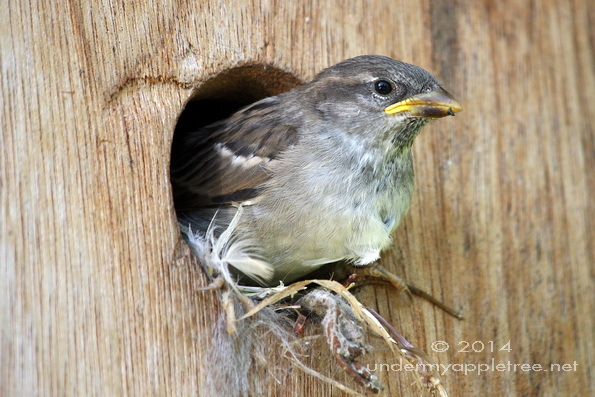 Two years ago the sparrows started terrorizing my wrens and even squeezed in the wren box. If there’s a bird nest in a gutter I’d say there’s a 99% chance it is a House Sparrow. They are extremely opportunistic. Every year there is a male sparrow chirping at the edge of one of the gutters on my house- and some years a female will actually build a nest there! After a while I named him “gutter guy”. Jason just got down from the roof and they weren’t in the gutters but there is a hole where the cedar siding comes together beside the gutter and I suspect they might be in there. We can hear them chirping and it sounds like they are in the wall of Gage’s bedroom! They need to be fed every 10 – 15 minutes. The parents won’t come back if they see you so you’ll need to hide and watch if you want to know what kind of bird is in there. On the positive side, once the nest starts chirping the babies are almost ready to leave – usually within the week. I love your weekly bird posts too Leslie. I learn so much, even if they aren’t the birds I see every day. Although we have introduced sparrows too, I’ve never seen them nesting- always more to learn about birds! Even mere sparrows. I’ve gone birding in Holland this week.